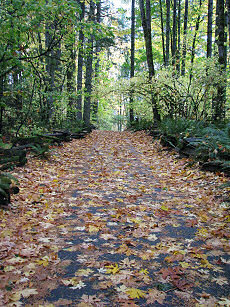 It’s time to celebrate blogging and summer in the Portland, Oregon, area. If you are a blogger, come join the summer Blog-b-que! 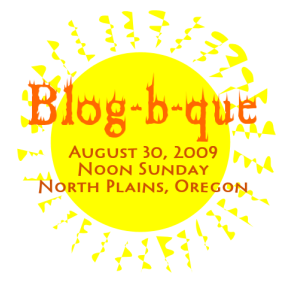 We’re hosting the first ever Blog-b-que at the home of Lorelle and Brent VanFossen in North Plains, Oregon, on Sunday, August 30, 2009, and you are welcome to join us. We’re inviting WordPress, WordPress.com, and all bloggers (and web and social media fans) to a picnic party on Sunday, August 30, starting about noon! The theme of the party is “Summer Food” and you are invited to bring food that reminds you of summer. In addition to summer food and drinks, bring something to sit on, sunscreen, sunglasses, and binoculars as this will be the final day of the famous Oregon International Airshow in Hillsboro. We have a view of the skies and areas west in the valley the planes will be flying through. We have a hot tub, so bring suits (and we have some to borrow). We are limited to 75 attendees. Sign up on the Upcoming Announcement where you will find directions and more information. You can also contact us with questions via the comments below, @lorelleonwp or via our Contact page. 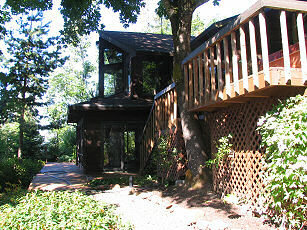 We live about 35 minutes from downtown Portland off Highway 26. Coming back from the beach that weekend? Stop in and rest before heading back to the city! We will help you arrange carpools from downtown Portland, and will do one or two pickups at the Hillsboro Trimet Blue Line (Hillsboro · City Center · Gresham), the last stop on the Blue Line. If you are interested in taking the train out, let us know so we can arrange pickup times. The Oregon International Air Show will feature some great airplanes and air performances on Sunday including the U.S. Air Force Thunderbirds, U.S. Army Golden Knights Parachute Jump Team, high performance aerobatic airplanes, The Robosauraus car-crushing, fire-breathing, metal giant of a dinosaur plane, comedy air performances, vertigo air shows, hammerhead aerobatics, antique airplanes, experimental aircraft, and plenty more. We will feature music, laughter, stories, and a ton of food! Whose bringing the keg? Come meet fellow WordPress and other blogging fans and join the summer fun. We have trails through the woods and down to the creek at the bottom of the property, plenty for kids (adult kids, too) to run around and explore. 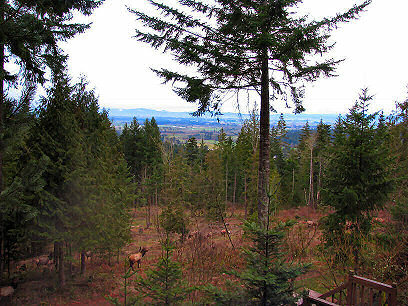 Elk, deer, rabbits, frogs, coyotes, and birds are around much of the year. We have a few indoor and outdoor games, but bring your own. This is a no smoking event! Note: Thank you to everyone who has been so helpful and supportive during my long health recovery. I will be back in action very soon and look forward to seeing everyone at this fun Blog-b-que! 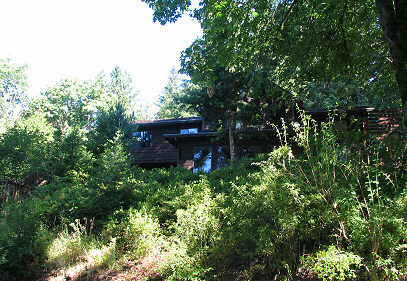 This entry was written by Lorelle VanFossen and posted on August 18, 2009 at 12:27 pm and filed under Blog Babble, Blogging, WordPress, WordPress Events, WordPress News with tags blog-b-que, blogbque, oregon, portland, portland oregon, social, social event, wordpress, wordpress events, WordPress News. Bookmark the permalink. Follow any comments here with the RSS feed for this post. Post a comment or leave a trackback: Trackback URL. If I could have come I would have been delighted to have brought a keg of Heineken or Hertog Jan (very good beer!). But alas, as I live in the Netherlands I don’t think I’m going to be able to make it. You guys and gals have a lot of fun on the 30th! Watch out for those planes now! Ah…I wish I could come… 😦 It would be great I think, post about the result okay?? You know what is the kicker for me? I am in Vancouver since 9pm (local time which I am sure it is same as Oregon), then on the 30th. I am flying to Los Angeles where I will stay for a week, then on the 6th. of September I am going to be in Atlanta until the 13th. then I go back to Toronto which two days later I am travelling for just over a month in Europe. Most likely my plane will be heading over your place and among those tiny ants below it will be you, and you will be having the bbq while I have horrible airplane food and I will be getting ready for around 2 months of travelling…….none which is for enjoyment. Why did I start being a fully responsible Blogger during the end of the summer? @Miroslav: I can’t believe you are THAT close and we’re not able to get together. We’ll be waving at you – actually, your plane will be diverted as the Oregon International Air Show will control much the of the airspace over our house. 😀 But we will wave BIG so you can see us! NEXT TIME! I forgot to mention: I hope you get better. The WordPress world is just not the same without you. If someone caused you to be sick *takes out chainsaw* run far far away. Glad to see you are still rocking and rolling! I just found you blog, love it! I can’t wait to dive in and learn more! Hope the blog-b-gue is great. i would have been delighted to have brought a keg of Heineken or Hertog Jan (very good beer!). But alas, as I live in the Netherlands I don’t think I’m going to be able to make it. Sounds like fun! Do you do this annually?